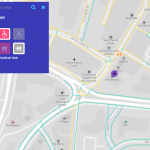 Route4U is a community-contributed tool that helps You to navigate on the sidewalks of a city. The purpose of the application is to give you the highest possible level of freedom in mobility, whether you are in your hometown or out exploring a new city. In exchange You can also help the community in many ways. We have data available in every single city of the world. and maybe obstacles (exclamation marks). With Route4U, you can search for accessible places, and if there’s information available already, you can have personalized sidewalk routes planned between two locations. We also have a web based map, with limited functionality here. What are the colours on the map? We use colours on Places (or Points of Interest – POI), sidewalks and crossings. Places can be gray, green, yellow and red. Green means the entrance is accessible with all kinds of wheelchairs. Yellow means entering is inconvenient but possible, either alone or with help. Red means “impossible” because of the characteristics of the entrance. Gray POI means insufficient data. But you can change that! Sidewalks can be green, yellow, orange, red and gray. The colours show the smoothness and/or the steepness of the sidewalk surface. red is impossible to roll on for most wheelchair users. Gray sidewalks are not yet mapped, but again, you can change that! Crossings can also be green, yellow, orange, red and gray. Colours of crossings indicate their kerb height. red ones have at least 10 cm high kerbs. Route4U’s Navigation function shows you personalized routes. You can set your accessibility preferences in the Settings. Can I also change colour of Places or sidewalks? Sure! 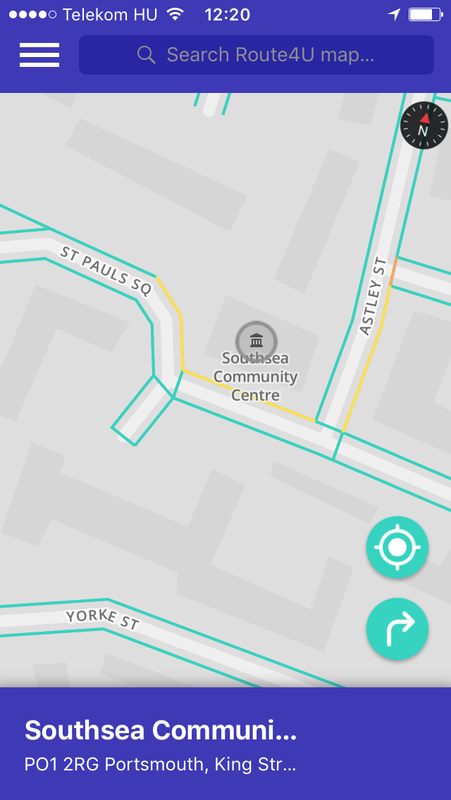 By tapping any Place on the map, you see their accessibility info. If there is no information yet (it’s gray) or if you find it incorrect you can change it’s properties by tapping the pencil icon and set it according to your findings. You can also add text on relevant details at the bottom. 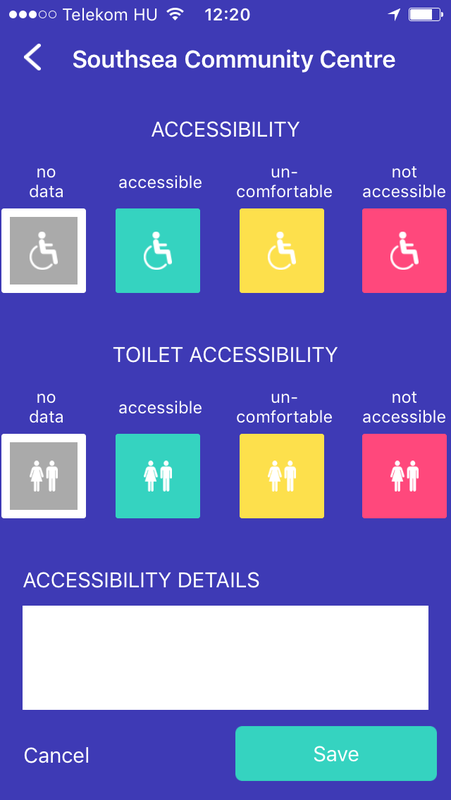 Please read our Assessment Guide to see what kind of toilets and entrances fit into which category. This way we can avoid false data appearing on the map. Don’t worry though! Sometimes it’s not easy to decide the colours. If you have doubts, just add some comments in the “Accessibility Details” box. See the guide here. 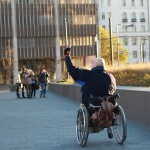 Every user can “survey” sidewalks, kerbs and preferred routes while they move around in the city. 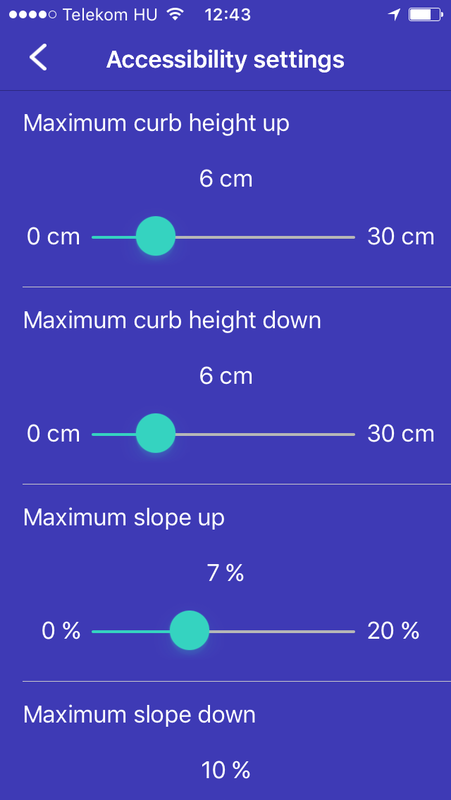 Tapping the ruler (survey button) – even if the area is already mapped – automatically helps the community by keeping the map data fresh and accurate. Same applies when using the app in navigation mode. 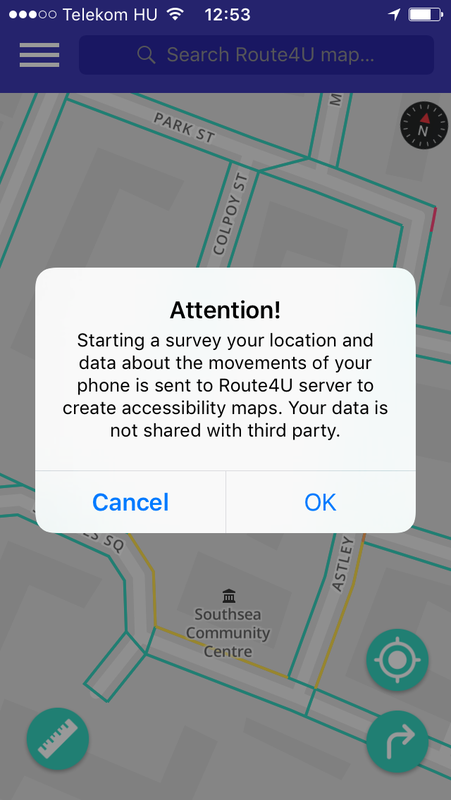 During survey, Route4U collects sensor data of your phone, and turns it into accessibility maps. No data about our users or their routes is given to a third party. This automatic survey function works best when you roll on the sidewalks and crossings. Surveying while driving or sitting in the car collects false data – however our built-in artificial intelligence will filter these out. What if the sidewalk would be fine, but is temporarily obstructed? You can notify other users about that! Long tap on the map, choose “Obstacle“. You can even add a photo for others to see. 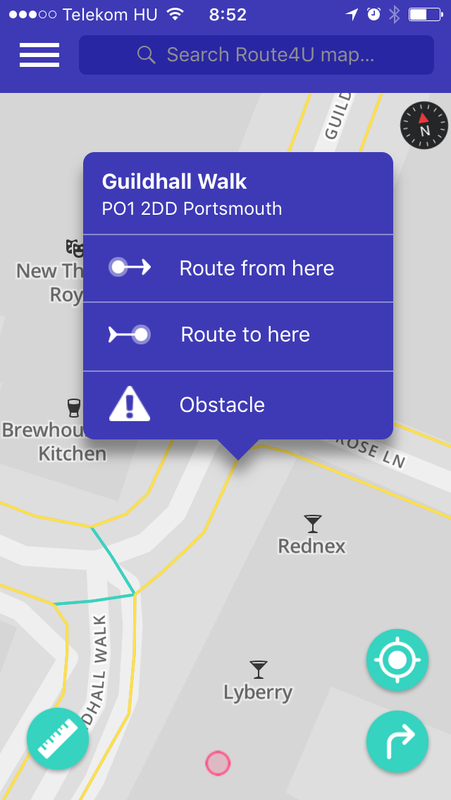 These obstacles also count in the route planning process, if the sidewalk is blocked, Route4U will show you an alternative route. Why does Route4U say “No route!” when I try to use the navigation function! We can only show you accessible routes on the mapped areas. 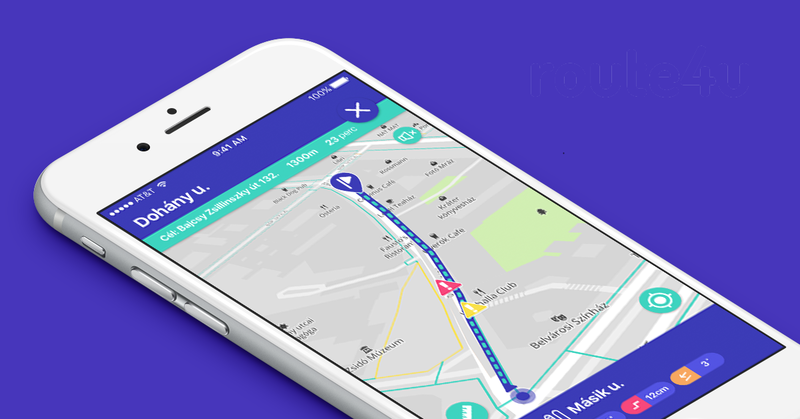 Route4U is a community based app, which means you and your friends can automatically map your city from zero, only by opening the app and tapping on the ruler icon. This way we receive sidewalk data that is turned into coloured sidewalk maps. If you are an active person from a not-yet mapped city, feel free to contact us at tibor@route4u.org and our cartographer will help you get things rolling. Does Route4U follow me when I am not using the app? Does Route4U use mobile data? Who can I contact if I have questions or something’s not working? Oh, and don’t forget to follow us on Facebook!